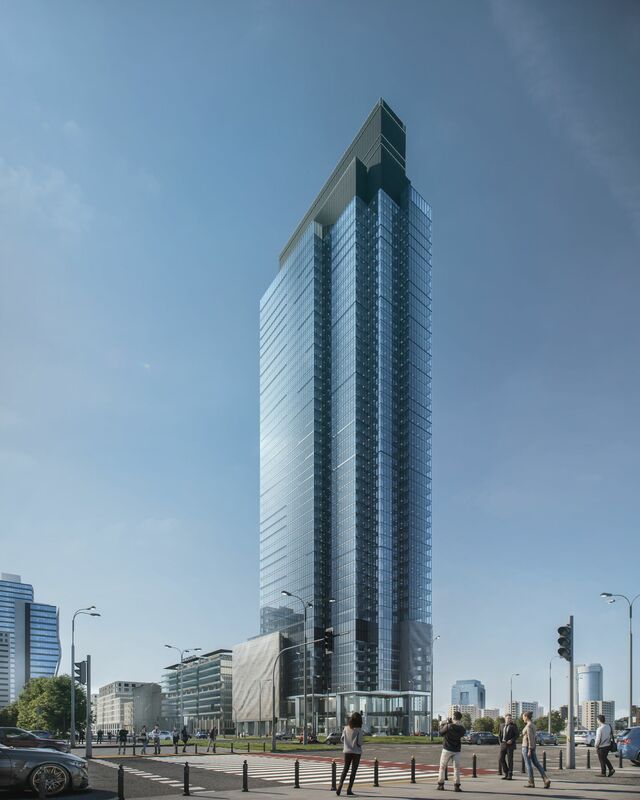 Ghelamco officially presented Warsaw UNIT, its latest project in the new business district of Warsaw, previously known as Spinnaker. The construction of the 180-metre skyscraper is pending and is scheduled to be completed in early 2021. Warsaw UNIT – this is the name of Ghelamco Poland’s new project, which is being built in Rondo Daszyńskiego 1. The building will be 180 metres high and with the technical equipment on the roof – 202 metres. It will provide tenants with around 57,000 sqm of modern office space on 45 floors. The project’s budget is nearly EUR 200 million. The building’s name, Warsaw UNIT, refers to the skyscraper’s unique architecture, its modernist roots (and more specifically to Unité d'Habitation – the iconic residential building in Marseille Housing Unit designed by Le Corbusier) and the project’s individual character where man as an individual is most important. It also refers to Ghelamco’s other projects around Rondo Daszyńskiego: Warsaw Spire and The Warsaw HUB, highlighting the Varsovian character of the developer’s flagship projects. “Warsaw UNIT is our yet another project on Rondo Daszyńskiego. With Warsaw Spire, the area has started to change its character. Today it is the biggest construction site in Poland. 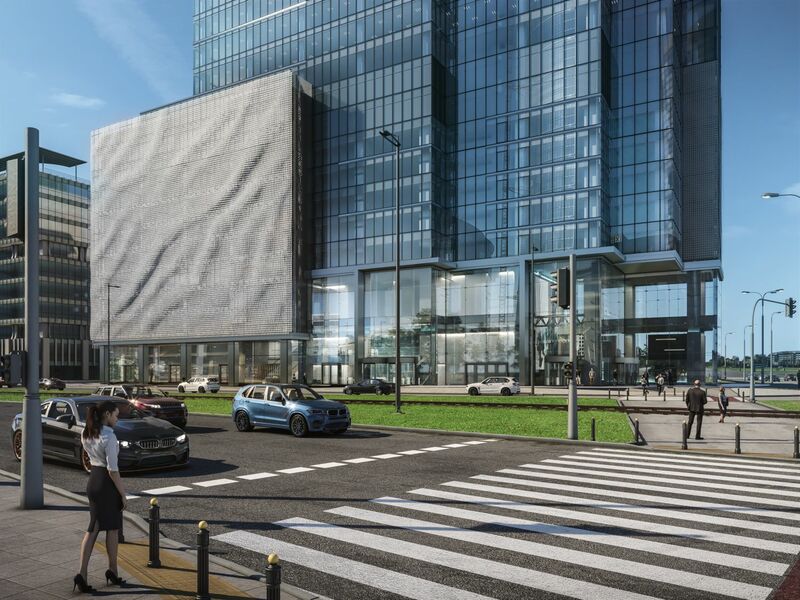 A new business centre of Warsaw is rising right in front of our eyes. Offices, hotels, flats, stores, food amenities and attractive public spaces are emerging in the direct neighbourhood. I think that in 2021 the place will become a showcase of the modern capital,” says Jarosław Zagórski, Commercial and Business Development Director, Ghelamco Poland. The architecture of Warsaw UNIT was designed by Projekt Polsko-Belgijska Pracownia Architektury, which is also a co-author of Warsaw Spire. “Our building is designed to be a functional machine deriving its energy from the vibrant business centre of the city. The transparency of walls in the lower storey seeks to obtain the effect of traffic permeating the life inside the building,” says architect Adam Wagner, President of Projekt Polsko-Belgijska Pracownia Architektury and author of the design of Warsaw UNIT. One of the most interesting elements of Warsaw UNIT’s architecture will be “dragon skin” façade in one part of the building, i.e. kinetic façade made of a few thousand moving plates. “It will visibly react to every, even the most gentle, puff of wind, forming on its surface unique images modelled by forces of nature,” explains Adam Wagner. This solution will be used in Poland for the first time. The ground floor of the building will host commercial spaces and food amenities, available for all from the street level. 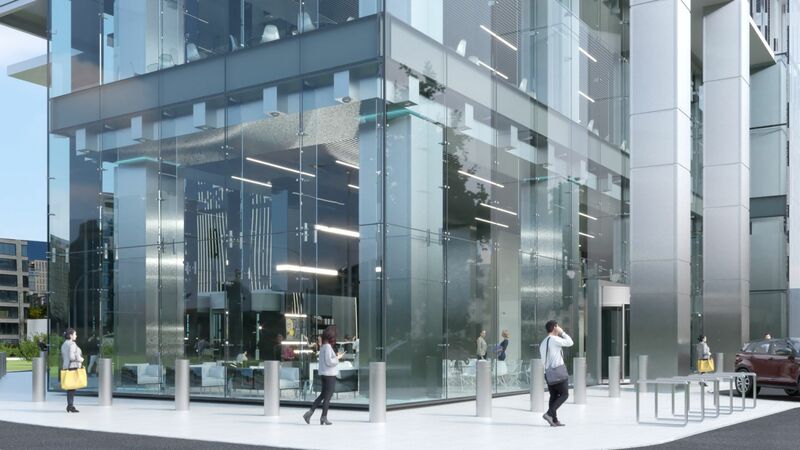 The building will be equipped with a parking lot for more than 450 cars, which will occupy 3 underground levels and 8 above-ground ones, located in the skyscraper’s podium. Similarly to all its projects, the developer has ensured green solutions. Warsaw UNIT will be certified in the BREEAM system with the Excellent rating and equipped with the infrastructure for cyclists: bicycle parking lot, locker rooms and showers. Warsaw UNIT is being built in the fastest developing part of Warsaw, in the city’s new business district. The skyscraper will emerge right on Rondo Daszyńskiego, in the corner of Prosta and Pańska streets. Major roads and transfer hubs meet in the direct vicinity. Nearby there are entrances to the second metro line station Rondo Daszyńskiego as well as bus and tram stops. In the vicinity there is also an urban and suburban train station. The underground part of Warsaw UNIT has already been delivered. Currently the construction works have entered the above-ground stage. The project is planned to be completed in early 2021.